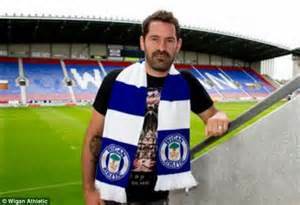 Scott Carson was Wigan’s best player in a disappointing team performance. The honeymoon period for Owen Coyle and the FA Cup winners came to an end at Dean Court. Latics were brought back to reality as a nervy, but resolute, Bournemouth team proved strong opposition. A succession of errors by Wigan handed the initiative to the home side who took full advantage of a weak performance from referee Graham Scott. Wigan had brought back Jean Beausejour in place of James McClean on the left wing. Shaun Maloney was to operate in central midfield together with James McCarthy, James McArthur and Ben Watson. By packing his midfield Coyle had to sacrifice width, the result being that Latics rarely looked dangerous in open play in the first half. The game opened with an error from Wigan in the first minute. McArthur’s slack pass allowed the home side to set up a clear chance for Lewis Grabban but Scott Carson blocked his shot. Latics had to work hard to contain a lively home team but it looked like they were heading to half time with a clean sheet. That was not to be as James Perch lost his concentration and sent a back pass directly to Grabban who took his goal well. Wigan started the second half with another major error as Beausejour’s clumsy challenge on Brett Pitman resulted in a penalty. The same player was to see his penalty kick saved by Carson diving to his left. Beausejour was substituted after 56 minutes, together with McArthur. The result was a much more attacking shape for Latics as Coyle brought on wingers Callum McManaman and James McClean. However, three minutes later McManaman was sent off after the Bournemouth players, staff and crowd put pressure on the referee. In a match where a number of rough challenges had been ignored by the referee, he nevertheless decided that McManaman’s tackle on Pitman merited a straight red card.It hardly looked even a foul. Ten man Wigan took the game to Bournemouth but could not find a way through. The nearest was a header from Leon Barnett cleared off the line. Scott Carson kept Latics in the game with a series of fine saves, including a penalty stop. The big Cumbrian looks like a bargain signing. It was good to see Coyle throw caution to the wind when he switched to an attacking 4-3-3 formation with McManaman and McClean on the wings, Grant Holt leading the attack and Maloney in an advanced midfield role. It is an option that he may well choose to employ during the course of the season. In their eight years in the Premier League Latics suffered a host of bad refereeing decisions. When they faced the top clubs it was almost an expectation that they would receive no favours from the referee. This is less likely to be the case in the more egalitarian Championship. However, referees are going to be influenced by the crowd and the pressure of home players. This was certainly the case in this match where the referee and his team made some poor decisions to Bournemouth’s benefit. Latics’ midfield disappointed: they were unable to provide the central strikers with clear chances for goal and they did not get in the area enough to trouble the Cherries defence. Too often the final pass was a hopeful centre. Moreover the lack of width stifled Wigan’s play. Although it would be easy to blame the referee for Latics’ woes it was their own errors that handed the initiative to the Cherries. Scott Carson: 8 – showed his experience and technique with his shot-stopping. His distribution still needs improvement, his long punts being easily dealt with by the opposing defence. Leon Barnett: 7 – continues to play well. Made a number of timely interceptions. James Perch: 5 – strangely off-key, not only with the back pass that led Bournemouth’s goal. Stephen Crainey: 5 – worked hard defensively, but his passing needs a lot of improvement. Ben Watson: 5 – worked hard, but to no avail. His long diagonal passes continue to go astray. James McCarthy: 5 – disappointing. Still adjusting to his more attacking role. James McArthur: 5 – not at his sharpest. Taken off after 56 minutes. Shaun Maloney: 5 – busy as always, but not at his best. Did not produce the kinds of incisive passes that are his trademark. Grant Holt: 6 – worked hard as always and showed his skill with some nice passes in the first half. Substituted after 65 minutes. Jean Beausejour: 5 – out of sorts and careless in giving away the penalty. Taken off after 56 minutes. Callum McManaman: – is the so called “horror tackle” of last season going to haunt him and influence referees against him? Let’s hope that referees will give him a fair crack of the whip this season. James McClean: – petulant and ineffective. Marc-Antoine Fortune: – came on after 61 minutes for Holt. He too was to be starved of decent service from the midfield.